Yet another sister to 9124E and 24278, this does have a slightly different history and a different future. Built at York in 1936, finished in teak and used all over the LNER and then Eastern region. However 9116E (as it had become) was not rebuilt in the 1950's and remained in its original form until its early withdrawl in 1962. Fate stepped in and it was converted to departmental use as DE321069. Moved to Perth depot in Scotland it's new role was as a staff coach. For nearly thirty years (until 1994) it served this purpose admirably, before finally being withdrawn and purchased for preservation. By this time it had been stripped of virtually all interior fittings and underframe equipment. Moved to the GCR major restoration started in 1997 with the underframe and bogies being overhauled. More recently work has stalled pending shed space for the body repairs (and while the owner diverted finance to the rebuild of Beavertail 1719E). When time and finance permits 24080 will emerge in full varnished teak. 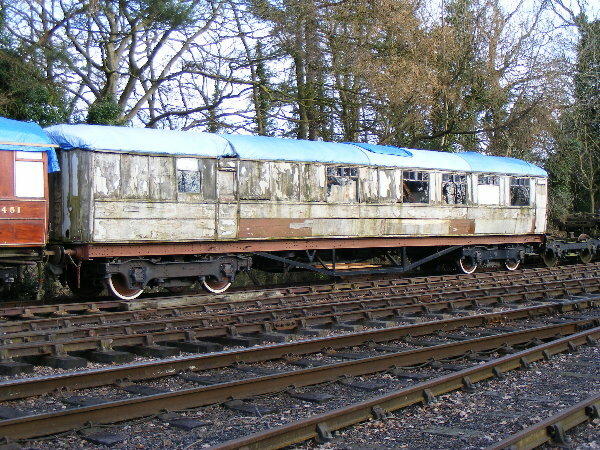 As we have a surplus of buffet vehicles the decision has been taken to convert this one to a first class dining car and this is the form in which it will return to service in due course.